Director/Producer – Hans-Christian Schmid, Screenplay – Bernd Lange, Photography – Bogumil Godfrejow, Production Design – Christian Goldbeck. Production Company – Xverlieh/23-5/SWR/Arte/WDR/Bayerischer Rundfunk/MFG Filmforderung Baden-Württemberg/Medienboard/FFA/Beauftragter für Kultur und Medien/Bavaria Film/Verlag der Autoren. 21 year-old Michaela Klingler pesters her conservative Catholic parents to let her go to university in Tübinger, despite their caution over her history of epilepsy. There Michaela settles into the girl’s dormitory. She becomes best friends with Hanna Imhof, who she went to school with, and makes a boyfriend in Stefan Weiser. Michaela’s mother disapproves of the modern clothing styles that she starts to adopt. At the same time, Michaela begins to suffer spasms, which leave her unable to touch her rosary or the crucifix, or to even complete schoolwork. She tells her priest that she hears demonic voices but he dismisses her and suggests that she see a psychiatrist, although another younger priest believes that Michaela is demonically possessed. As things become worse, Michaela cannot be sure that what is happening is not due to epilepsy or mental illness. Requiem is a film based on the true-life story of Annaliese Michel. In 1976, Annaliese Michel died in Wurzburg, Germany after two Catholic priests and her parents attempted to exorcise her of demonic forces after she supposedly became possessed while at university. In a trial that took place in 1978, both the priests and parents were convicted of manslaughter for their negligence in failing to feed or seek medical treatment for Annaliese. Experts argued that Annaliese Michel had only suffered from epilepsy. Both the court and later a commission of investigation from the Catholic Church issued damning statements that they were sure that no demonic possession had ever occurred and that what had happened was merely the results of both the parents and priests’ superstitions. There is however much mythology that has grown up around Anneliese Michel, including the subsequently disproved belief that her body remained preserved after her death, while her gravesite has become a popular destination of pilgrimage for many devout. The Annaliese Michel case back came into the public eye in 2005 with the release of the American-made film The Exorcism of Emily Rose (2005). The Exorcism of Emily Rose was a huge worldwide hit due to a canny marketing campaign that sold it as a true story, which had many rushing to discover the facts of the Anneliese Michel case. Of course, when one did so, what became apparent was that The Exorcism of Emily Rose had widely stretched the truth of the Anneliese Michel case – it had not merely changed the names of the principals, it had moved the story from Germany in 1976 to Midwestern USA in 2005. The more subtle difference that became apparent was that The Exorcism of Emily Rose swayed the outcome of the court case towards a much more forgiving exoneration of the priests’ actions. Unlike the real-life court case, Emily Rose‘s makers seemed in no doubt whatsoever about the actuality of Anneliese Michel/Emily Rose’s possession by demonic forces – something that made much more sense when you discovered that director Scott Derrickson is an evangelical Christian and that Emily Rose had an entire marketing campaign that pitched the film direct to Christian church groups. There was also the subsequent low-budget Anneliese: The Exorcist Tapes (2011), which tried to tell the Anneliese Michel story as a Found Footage film, but that also bought into the view that there was a genuine demonic possession. Requiem comes as a welcome relief after The Exorcism of Emily Rose‘s clear pro-Christian bias. Requiem does change the names of the principals involved (one should note that the heroine Michaela is a rough anagrammatic rearrangement of A. Michel) and the location – which is forgivable dramatic licence, something that most non-fiction films do in regard to stories that take place where many of the participants are still alive. Unlike Emily Rose, Requiem gives us a far more accurate insight into many of the aspects of Anneliese Michel’s story – her diagnosis of epilepsy and seizures; her frustration with the efficacy of prescribed medical treatments and eventual decision to stop taking the drugs; her own conviction that the source of her problems was demonic possession; the claims of seeing demonic faces and being unable to touch religious objects. Unlike The Exorcism of Emily Rose, Requiem also retains the 1970s setting. This is subtly conveyed – the use of an old electric shavers and a portable typewriter – although other aspects like the fashions are ambiguous enough that it would not be hard to imagine Requiem taking place in 2006. Where The Exorcism of Emily Rose drew heavily upon the clichés that had been put in place by The Exorcist (1973), Requiem welcomely abandons them. There are no horror movie cliché conventions here – and Requiem is all the more effective for that. 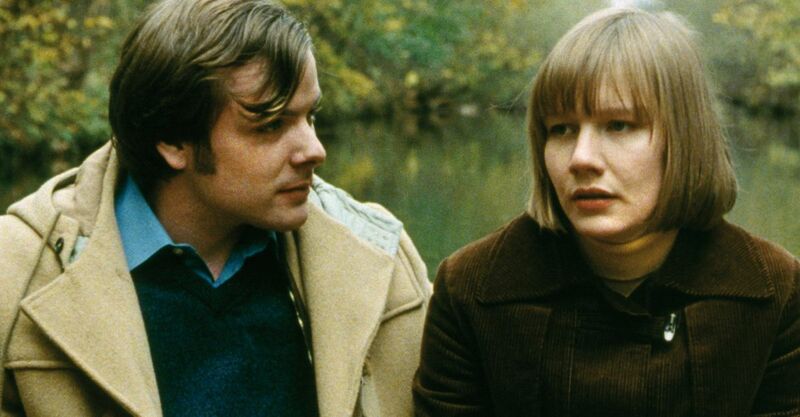 Requiem is almost a Dogme film in some regards – the drama takes place naturalistically and the camera is often handheld. 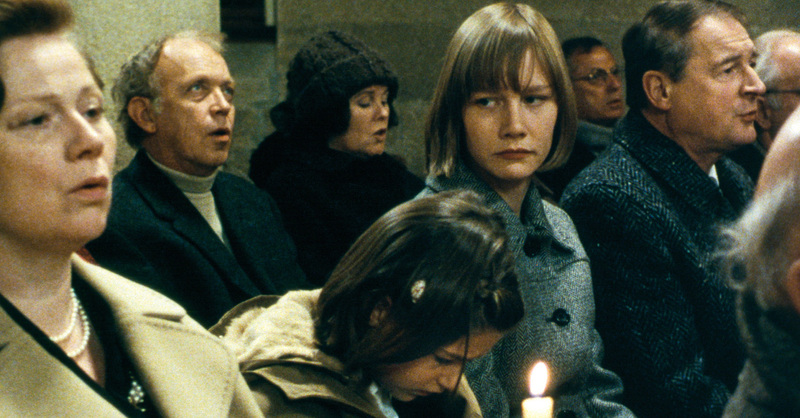 The scenes with Sandra Hüller struggling to pick up a rosary or stretch her fingers out to touch a crucifix have a tense, painful realism that convey the inner struggle with a genuine tension that none of the effects-driven Exorcist copies ever demonstrated. When the exorcism does come at the end, with the handheld camera observing the party gathered around an ordinary sofa in a lounge, the effect is raw – as though one is looking in on a real exorcism, not one that has been dramatically pumped up with rotating heads, rocking beds and gross-out effects. The Exorcism of Emily Rose, by its very claim to be telling the story of a real exorcism, had the opportunity to do something that deconstructed and broke away from the Exorcist clichés, but failed to do so; however, Requiem accepts this challenge and succeeds admirably. In comparison to The Exorcism of Emily Rose‘s ardent certainty of possession as an actual phenomenon, Requiem does an exacting job of offering a well balanced argument for a purely mundane explanation of the possession. Director Hans-Christian Schmid ekes out a careful portrait of Michaela/Anneliese’s piety and belief in martyrdom; her problems with epilepsy and failing to take ineffective epilepsy medication; the superstitions of the priest; the family’s conservative beliefs and the suggestion that much of Michaela’s behaviour possibly stems from her breaking away from a staunchly controlled and authoritarian home life. For all that, the script does not come down on the participants in the incident as critically as the trial and the Catholic commission of enquiry did. Although the trial indicted the priests and parents as criminally negligent, the film is much more sympathetic to them. At times, Requiem deliberately plays them against type – the first priest that Michaela goes to wants nothing to do with the notion of exorcism and it is the hot-headed younger priest who later warms to the idea; while Michaela’s mother is played as staunchly religious and disapproving of her breakaway behaviour, her father is shown as softer, caught between facilitating many of the things that hid Michaela’s mental illness, and the film shows both parents shocked when the exorcism begins. Surprisingly, the one thing that Requiem does not cover – in fact, even mention at all – is the trial. The film simply fades out at the point where Michaela’s friend Hanna takes her away from the home for a ride and offers her the opportunity to escape from it all but where Michaela makes the decision to return. With an extraordinary casualness, the end credits merely mention that Michaela died after a dozen exorcisms, whereas in truth Annaliese Michel died after the priests performed exorcisms twice daily for an entire year, a situation that amounted to imprisoned abuse and torture (albeit with religious justification). The lack of depiction here presents this side of the case with an amazing lack of significance. It is an anti-climactic ending, although maybe one where the filmmakers have deliberately sought not to cover ground the same ground that The Exorcism of Emily Rose already had. The other thing that one discovers is that while Requiem does not go as far as The Exorcism of Emily Rose did in claiming that the exorcism was absolutely real, nor does the film go to the extent that the trial and Catholic Church did in real-life in denying that there was any spiritual reality to what happened either. Rather, Requiem treads an ambiguous line – one that makes a strong case for the incident being mental illness but perhaps goes only three-quarters of the way in stating this to definitely be the case. Requiem has some fine and convincing performances from all the principals. Particularly standout is the performance from 28 year-old Sandra Hüller who manages to seem both appealingly innocent, agonisingly distraught and entirely convincing and sympathetic when in the thrall of her mental illness. Both Hüller and director Hans-Christian Schmid make an especial point of avoiding clichéd and melodramatic portraits of mental illness – a la Mad Love (1995) and the thoroughly overrated likes of Shine (1996), and A Beautiful Mind (2001). What surprises about Sandra Hüller’s performance is how normal she seems for the majority of the time, before Hans-Christian Schmid pulls back and starts to show some of what she is doing from other people’s points-of-view. The scenes that the film slowly builds to where she suddenly starts barking and acting possessed in the kitchen are startling. (Winner in this site’s Top 10 Films of 2006 list. Winner for Best Actres (Sandra Hüller) at this site’s Best of 2006 Awards).